After finishing your build, the last step before flight is configuring all of the software that keeps your quadcopter in the air. 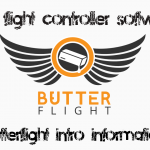 If you heeded our Buyer’s Guides, we expect you decided to get a flight controller capable of running Betaflight and some BLHeli ESCs. That’s great! It means that setting up your software for the first time can actually be really simple! You can expect the total set-up process to take between 10-50 minutes depending on how many steps you have to complete. You should bring your quadcopter (with the props removed), a battery, your radio transmitter and a micro USB cable to your computer desk all at once so you don’t have to keep juggling your gear around. We’ve split the process into 3 articles, each with step-by-step instructions to make the whole thing foolproof. Once you’re finished, you’ll have a quadcopter flying the latest versions of the premier racing drone software for flight controllers and ESCs alike. 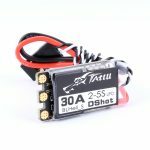 The first thing you’ll want to do after building your miniquad is install up to date firmware on your flight controller and ESCs. Think of this as updating your quadcopter’s “drivers”. This article breaks this process down in an easy to follow format that includes links and instructions to install all of the software you will need on your PC for the rest of the steps. 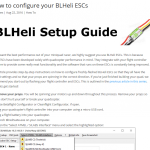 In this article, we provide step-by-step instructions on how to configure freshly-flashed BLHeli ESCs so that they all have the correct settings and ensuring that your props are spinning in the correct direction. 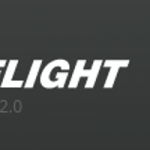 This will also make the Betaflight configuration process easier, as you can follow our step by step instructions using the numbers from this guide! 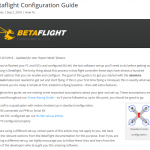 After you’ve flashed your FC and ESCs and configured BLHeli, the last software set-up you’ll need to do before getting out and flying is Betaflight – the “operating system” controlling your drone. This is by far the most in-depth part of the set-up process, and we’ve simplified it as much as we know how in this handy guide. 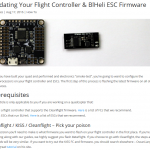 For those that like video instructions, we put together a video guide near the end of the post that shows the entire Betaflight configuration process. Similarly, if you need help setting up your transmitter, you can follow our guide here.